A surprising debut album coming out of nowhere! 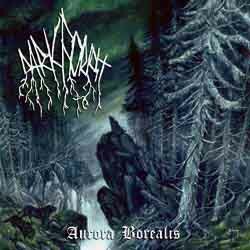 Dark Forest is the personal project of David Parks from Canada and he formed the band back in 2003 (there are many other bands with the same name from other countries). This is their first full-length work that was initially self released in 500 copies. In 2007 they signed to Bleak Art Records that re-released it including 4 bonus tracks from Demo 2005. The re-release came with a slightly improved artwork and real drums from Griffin Kissack, instead of drum machine. So the total duration of the album exceeded 68 minutes! “Aurora Borealis” is an epic black metal album with many pagan Viking elements. Most of the time their music has the classic epic mid tempo guitar riffing, mixing it with many slower acoustic and atmospheric parts. The keyboards are used very cleverly; sometimes they stay in the background, sometimes the carry the lead melodies and other times they simply add some folk touches. All of their compositions are great, with many changes inside each song and a very good production. I have only listened to the first edition, so I guess the Bleak Art edition will be even better. Their vocals are mostly black metal screaming, but there are also some clean Viking ones in the most epic parts. The excellent cover artwork is another brilliant work of Kris Verwimp. Overall “Aurora Borealis” is a safe investment for all fans of this genre. Maybe Dark Forest don’t actually add something new to this overcrowded scene (not that they remind of something particular), but their music is very well played and composed epic pagan black metal and they seem to have all the potentials for something bigger… If you want to listen to their music you can visit they links below.